As I finally get the hang of having two children (it only took a little over a year), we have started taking more one off day trips to various places. We love traveling and enjoying the world beyond our house. What I found though was that I was overpacking. One time, Andrew was like, “why is all this stuff going with us for 6 hours?” My response: “we might need it”. The truth is, we didn’t. And in the unforeseen circumstance that we may, there’s usually a store within 5-10 minutes of anywhere that we go. We could easily just run in to one and grab what we need. I mean I was packing the same amount of stuff if we were running to Target, going to be gone the entire day, or spend the night away. Seriously, moms, we have to stop overpacking!! Whether the beach, a national park, or an amusement park, there are some things that I absolutely must pack. These are no brainers for us. 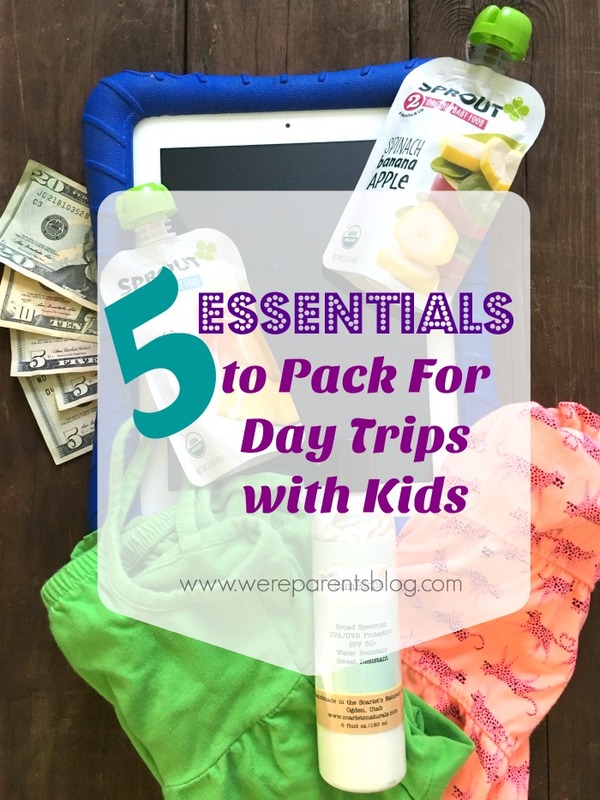 I won’t leave the house for a trip without these 5 essentials to pack for a day trip with kids. This may sound silly. Everyone accepts credit cards nowadays, right? WRONG. We’ve run into many places that still only accept cash or other places that you can get a discount for using cash. So now, we always make sure we travel with cash. Tip: If traveling for more than one day, see if your local bank is nearby your destination. This way, you aren’t traveling with a lot of cash, and instead can just grab more as needed. No matter the age of your kids, pack an extra set of clothes. Kids are messy, life happens, always have extra clothes. Tip: Pick light clothing and fold it up into a gallon size resealable bag so it doesn’t take up a lot of room. Keep this in your car and switch out every 3-6 months. Forget the toys. Instead load a tablet with educational games or take a DVD player. Toys get thrown, lost in the car, etc., and no one has time to listen to screaming because of fighting over a toy or because a toy fell onto the ground. Tip: Load a CD case with DVDs if going on a long trip so you only have one case to take instead of trying to making 15 DVD cases. No matter where you go, you’re likely going to be out in the sun at some point with your kids. We love UVA protective clothing so we don’t have to worry about lathering sunscreen on later. Tip: Skip the spray sunscreen. It’s not safe for kids to inhale and most kids can’t hold their breath long enough to not inhale. NEVER LEAVE HOME WITHOUT SNACKS! Almost all of your sanity can be saved with snacks. Tip: Choose healthy, non-refrigerated snacks so you don’t have to worry about a cooler. 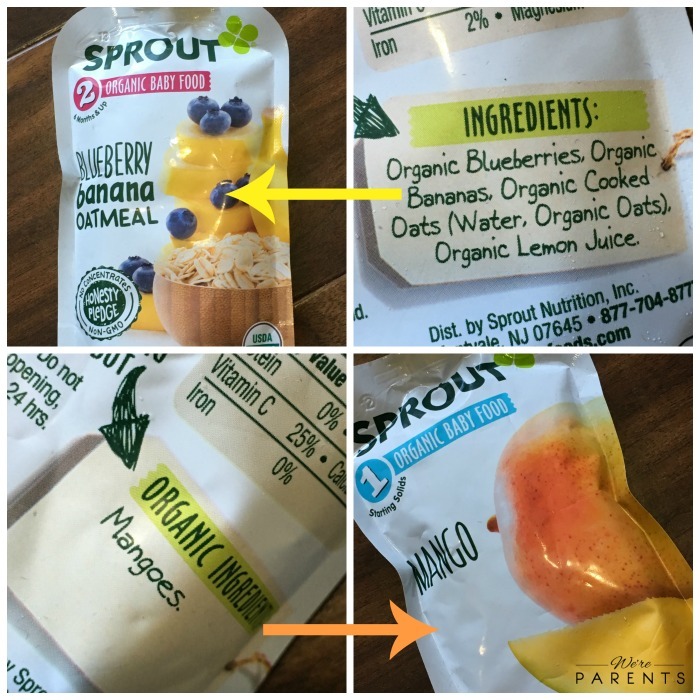 We love Sprout foods for our snacks options, especially the pouches! 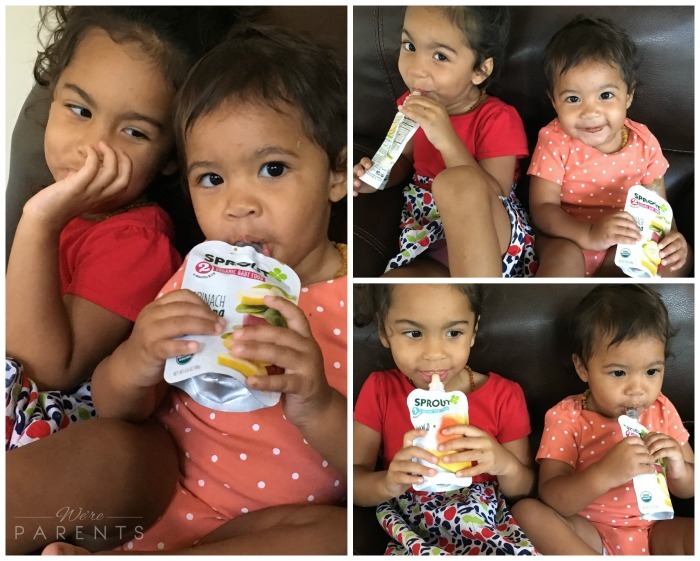 Unlike leading competitors that primarily focus on two flavors (apple or pear); Sprout offers delicious blends of whole fruits, vegetables, and grains giving babies greater exposure to wholesome foods. Additionally, Sprout honestly labels their products so Flavor names match the primary order of ingredients inside. This way Moms knows EXACTLY what they are feeding their babies. 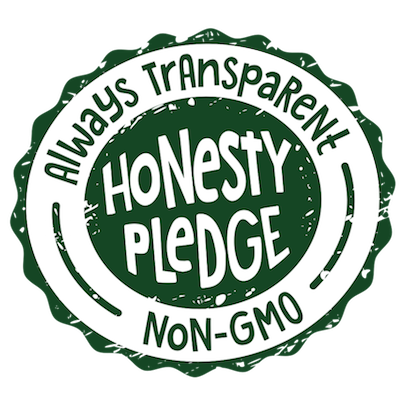 In fact, Sprout’s Honesty Pledge commits them to transparency and honest labeling. Flip over the pouch and the ingredients on the back, match the ingredients on the front with whole fruits, vegetables, and grains! It’s one less thing I have to worry about on our trip! Download a Buy One, Get One Free Sprout Coupons​ here to grab some new pouch flavors before your next trip! The new flavors are: Mango, Spinach Banana Apple, Blueberry Banana Oatmeal, and Pear Spinach Prune. Find out Where to Buy Sprout Snacks. Watch the Sprout Video to learn more on how Sprout wants to “Keep it Honest, Make it Real” by being dedicated to research that shows developing a love of healthy foods early on helps foster healthy eating habits for life as a part of their Mission & Values. What about you? 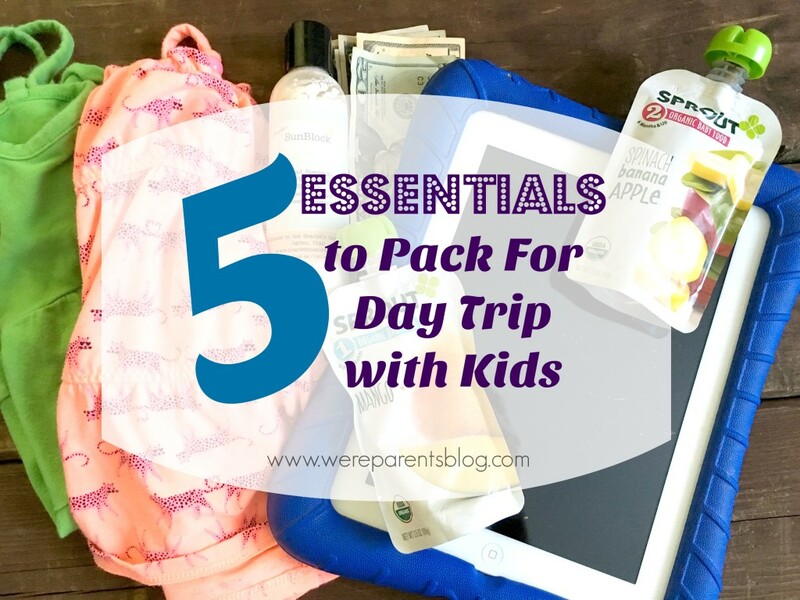 What are your must pack essentials for a day trip with kids? 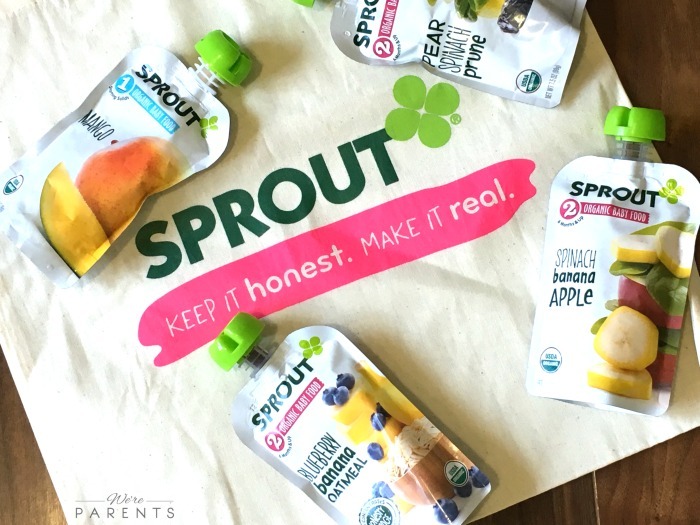 What new flavor Sprout Pouch are you going to try?